Please subscribe, download, watch or listen, review and share! Each week there will be a class presentation as well as a question and answer session. All sessions will be recorded for future access. This may be the only time the course is offered with live interaction with our healing wizard, Dr. Glen, since more advanced courses will follow this one, in particular, certification courses in Biocommunication and Healing modalities. Outstanding students may be selected for eligibility as paid tutors and coaches in future delivery of this course. A limited ratio of work-trade scholarship positions are available by application based on a combination of need and merit. Work trade can include extra studies and written assignments including reviewing the various written works, published DVDs, and product formulations offered by Healing Oasis. This would involve some material costs for purchase of books, DVDs and products over the months of the course unless covered by personal referral points. Referral of at least one non-scholarship student is a prerequisite to matriculation of accepted students with scholarship standing. All students participate in some level of experiential Accelerated Self-Healing during the course to enhance personal progress and integrate conceptual learning. All students will be entitled to a 30 day unconditional money back guarantee beginning September 21st and ending October 31st. 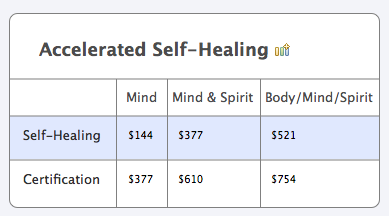 This current revision has been implemented in order to make the course as accessible as possible for those who are also seeking active support for Accelerated Self-Healing. Healing the healers is a central mission. Most of us are drawn to healing because of our personal challenges and needs, and as we heal ourselves, our healing abilities also progress. Every spiritual gift is the pearl we grow in response to some challenging irritation in life. Hence, the classroom and related laboratory work is now being offered with an integrated and incremental design to increase accessibility, flexibility and budgetary predictability. There will be a generous proportion of scholarships available to those with demonstrated financial need. If insufficient spaces are available, awards will be made on the basis of merit demonstrated in the application process, such as an essay on the student's qualifications, motivations and purposes for electing to study The Clinical Theory of Everything. All scholarship students must further qualify through referral of at least 2 paying students at any level. Referral of paying students by any participant can qualify for upgrading of their educational and/or self-healing program and offsetting all tuition and integrated service and material costs. Extra referral points can be accumulated and applied to future trainings and course offerings. Schools, Clinics, Health and Personal Development marketing professionals and others with significant influence in our niche wishing to apply for an affiliate relationship must inquire and apply separately for that function. The web architecture to support that application process is under construction at this time. Our goal is to test as frequently as once a month, plus as needed during any cleansing reactions. If we have a full complement of Interns, this may be achievable. 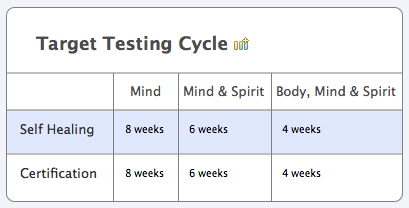 If not, our target for minimum testing schedule is shown in the chart below based on the type of healing program. This would allow for at least 3 tests during the 6 months for those not taking any remedies, which will at least be enough to potentially observe progressive or seasonal changes. For those receiving a personally formulated liquid combination remedy, potentially including homeopathic, herbal, flower essence and other ingredients, a minimum test cycle of about 6 weeks would allow for about 4 remedy cycles during the 6 months of the course. For the maximum support potentially including some kind of capsule, tablet or powder supplement support, testing on a monthly cycle will allow about 5-6 cycles during the course. The total number of openings at the Mind level is estimated at 500 maximum. That number could change based on enrolment of Certification students in Internship weeks in Hawaii to learn how to test. The maximum number of internship weeks available is 96. The value is set at $997 per week not including housing, or $1997 including an onsite room at Riverbend House, if available. Students may reserve an available spot at this price, or bid a lower amount for a range of weeks. Schedules will be finalized a month in advance to allow for travel plans. At this point, we anticipate capping the total number of participants at 700, with a maximum of 200 in all the more intensive therapeutic levels combined. These numbers are subject to change. It is yet to be determined whether enrolment will be open at some later date on an evergreen basis, or whether discrete classes will be initiated by future launch processes. We hope that some of our most talented and successful students will be able to help us expand class size in future iterations, whether steady state, pulsatile or some combination (akin to circulation in the body). The Referral chart shows the number of full tuition paying (non-scholarship) referred students (at any level) needed to qualify for free tuition at that level. If you referred a paying student and they are studying for free because of their own referrals, they still qualify you towards your free tuition. It is intended to be a win-win-win gamification for you, those who you engage, and your University. This program is designed to benefit the University by extending our outreach through our own student body. It is also designed to benefit you in multiple ways as a student. Obviously, being able to qualify for free tuition, an upgraded educational and self-healing program and other rewards such as free tuition in future workshops and courses is a major benefit. The more hidden, longer-term benefit is that by growing your personal connections, communication skills and marketing savvy, you are learning important skill sets that are essential to your future success, and you are developing lasting connections for establishing and building your own personal healing tribe. One of the most valuable assets you can begin to cultivate is to build topically targeted lists of your contacts and connections. Start doing that today, before you do anything else, for the health and personal growth niche, and you will never regret it. Start with a list of the people you know who are interested in or open to accelerated natural healing and personal growth. Those who do not become students alongside you may well grow to appreciate you as a mentor. A great first step is to let them know of your plans to take this course and your vision of your mission with this work. It is possible that 3 referral credits may qualify for free attendance in lieu of tuition.